When people think German wine, they think Riesling. But the sun-soaked hillsides of central Germany produce an astonishing variety of grapes that are carefully turned into flavorful wines. And while German staples like Riesling (the easiest to find in American stores) are plentiful, we discovered several lesser-known, quality wines with a fresh, fruity acidity that could very well become hits on the other side of the Atlantic, too. Most of Germany’s thirteen wine regions are concentrated to the south of Frankfurt, a good place to start a local food and wine tour. Our triangular rail route, to the east and south of Frankfurt, took us first to Würzburg and Iphofen, in the Franconian wine region with its wide variety of mainly white grapes, then on to Heilbronn and Stuttgart in the Württemberg region, where red wine grapes thrive on the steep slopes of the Neckar River. Würzburg is a charming city of 140,000, located along the banks of the Main River. 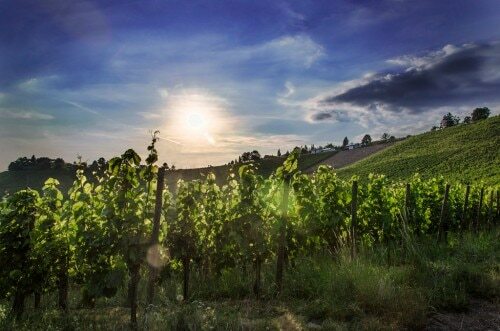 Rolling hills and steep banks are filled with lush vineyards, where some Riesling is grown, though the main varieties are Silvaner, the flagship wine of Franconian viticulture, and the widely grown Müller-Thurgau. Often in a Trocken (dry) style, these delicious local wines are usually sold in the distinctive bocksbeutel – a short-necked, round bottle. Beyond wine, cultural touch points dot the green landscape. The city of Würzburg was heavily bombed during World War II, but the Würzburg Residence, a palace completed in 1744 and patterned after Versailles, was mostly spared. The beautiful structure includes the world’s largest continuous ceiling fresco, which is above the grand staircase, and a vast, vaulted wine cellar in the basement. From Würzburg, we took a side trip to the nearby Bavarian town of Iphofen. Spared from Allied bombing in the war, this medieval masterpiece is surrounded by a 13th-century wall and a series of completely preserved towers and gates. 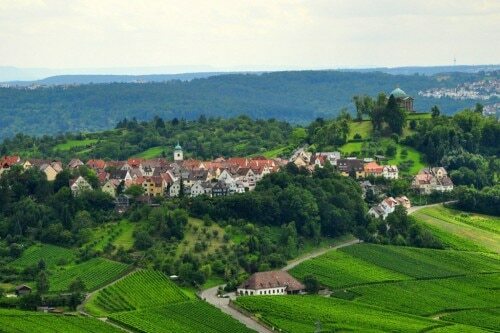 Roam through lush vineyards on nearby hillsides, many growing the Scheurebe grape, which overlook the ancient town. We enjoyed lunch at the Restaurant Zehntkeller with its superb, sophisticated Franconian dishes accompanied by wine from its own vineyard. We sampled pumpkin soup with suckling pig jowls, roebuck steak with sea buckthorns and celery ravioli as well as wild catfish with baked veal compote. For such a small town, Iphofen offers gourmet treats in every sense. The next day, a short train ride took us south to Heilbronn, a thriving city of 125,000 in the Württemberg wine district. Almost totally destroyed by bombing in 1944, it was rebuilt and is very modern looking, but surrounded by cascading vineyards. The Heilbronner Weindorf, an annual festival, celebrates both wine and the city’s culinary prowess; a variety of local dishes include onion cakes, bretzels (the German version of pretzels) and sausage-in-a-bun, which are rumored to have been cooked in half-meter stretches in years past. We also met a local guide near Heilbronn who took us on a long hike around the nearby vineyards. There, we were able to sample some outstanding sparkling secco and excellent red wines like Lemberger and Trollinger. Our final stop was in the city of Stuttgart, a pleasant 45 minute train ride from Heilbronn. Despite being a major metropolitan area, two-thirds of the land within the city limits is devoted to parks, gardens and woods, making it surprisingly tranquil. The city is also home to the Staatsgalerie museum, which houses paintings by Picasso, Dali, Warhol and Edvard Munch. 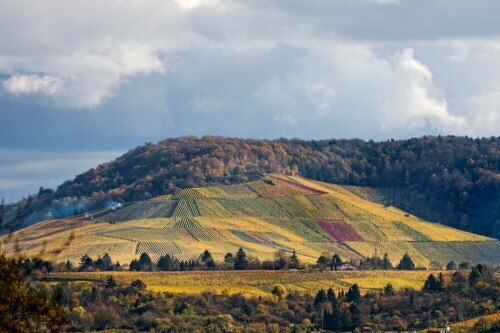 Fine wines are produced close to Stuttgart, and we visited the stone-terraced vineyards of Karl Haidle. There, we tasted a superb 2011 Lemberger, an intensely flavored red from vines pruned to only six bunches of grapes. This area of Germany often goes unexplored by travelers, but for those looking for delectable, unique wines and lush peaceful hills that roll across ancient cities, this might just be the place they’ve been waiting to see.